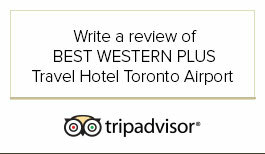 The Best Western Plus Travel Hotel Toronto Airport is a modern traveler's dream come true. It is a convenient, spacious Toronto Pearson International airport hotel that offers reasonable rates and luxurious newly renovated rooms. Our location is perfect for Toronto and Mississauga business travelers, visitors to the Greater Toronto Area, and those who need a place to stay overnight on airline connections. You'll love the touches we've added to our Toronto Airport Hotel Accommodations to make it as comfortable as possible for your stay. Whether you just need a bed for a few hours in between flights or are staying for several days, our hotel amenities will provide you with all you could ask for. Relax in our hot tub, and let our complimentary airport shuttle take you to and from Pearson Airport to ease your travel worries. Airport Shuttle pick-ups are available 24/7 and can be arranged by calling the hotel at 416-620-6805/416-620-1234 or by using the airport courtesy phones at Terminal 1 & Terminal 3 once you have your baggage. Drop offs should be scheduled with the front desk one day prior to your departure or at check-in if you depart the next day. Toronto Pearson International Airport. All guests will appreciate our location as the noise of arriving and departing aircraft is minimal. We are only 20 minutes from downtown Toronto and 5 minutes from Mississauga, so you're never far away from great entertainment, shopping, and dining! Whether you're spending a few hours or a few days at our airport hotel, you’ll find countless things to do in Toronto. Our hotel is only a few minutes' drive from some of Toronto's major attractions such as Roger’s Centre, CN Tower, Air Canada Centre, Ontario Place, Canada’s Wonderland, Centennial Park, Hershey Centre and the Woodbine Racetrack. For Toronto airport hotels with parking, nothing beats the Best Western Plus Travel Hotel Toronto Airport. Book your room today! One night accommodations with one or two week parking and complimentary shuttle service to Toronto Airport (YYZ). Convenient Airport Hotel. Everything you would need available in room…quick shuttle service. Very good value for an overnight stay. Home away from Home. When I have to stay over in Toronto I always stay here. The staff are friendly…the rooms are modern and always clean. I would recommend this hotel to anyone. Great location. Clean Rooms. Friendly staff. We would definitely stay here again. Micheles is an Italian restaurant and a real gem for the Best Western Plus. Will definitely stay again.